Business bill of sale form is the legal document which is filled when selling a business to another person or party. 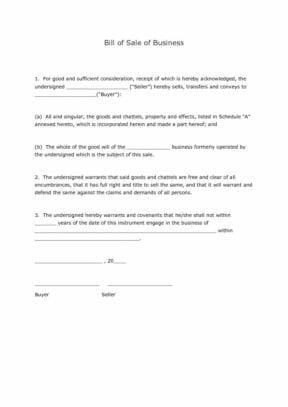 This form is a kind of acknowledgement of the receipt of payment by the seller and also an authorization to the buyer to hold possession of all the belongings, including properties, chattels and effects of the business, the list of which will be annexed with this business bill of sale form, as “Schedule A”, and it will become part of this agreement. This is a general form and can be used in all States of USA unless a State introduces its own form. This form is executed under the rules and laws of the concerned State. In this paragraph, the seller acknowledges the receipt of payment and transfers and conveys the business to the buyer. The seller will mention his full name at the specified blank space and will also fill the name of the buyer at the blank space specified for this purpose. The seller agrees to transfer the following to the buyer. (a) All the goods, properties, effects and chattels, the complete list of which is attached with this Business Bill of Sale Form and made the part of this form as Annexure A. (b) The whole goodwill of this business, previously operated by the seller. The name of the business will be mentioned, for example, “Samina Enterprises”, or “Voyage Travel”. In this paragraph, the seller declares that all the properties and chattels are free from all burdens and hindrances; and that the seller is fully authorized to sell all these properties. The seller also gives warranty to defend against any claims and demands by any person. In this paragraph, the seller permits and agrees that he will not do the same business within a certain period of time and within the certain limits. The number of years, the name of the business and the territory limits are to be given in the spaces, left blank for this purpose. For example, 2, 3 or 4 years, business means “travel agency business” or “transport business” and territory means “Manhattan” or “Hampshire”. In the next paragraph, date, month and year are to be mentioned. In the end, space is specified for the signatures of the Buyer and the Seller.